Creating the best admin areas and dashboards for an app or other types of project is as crucial as getting the appearance of the front-end pages correct. That said, building and designing all these layouts and pages for back-end areas is not a simple task and it can be quite time-consuming. However, there are plenty of excellent Bootstrap templates out there, which will simplify the above-mentioned process. 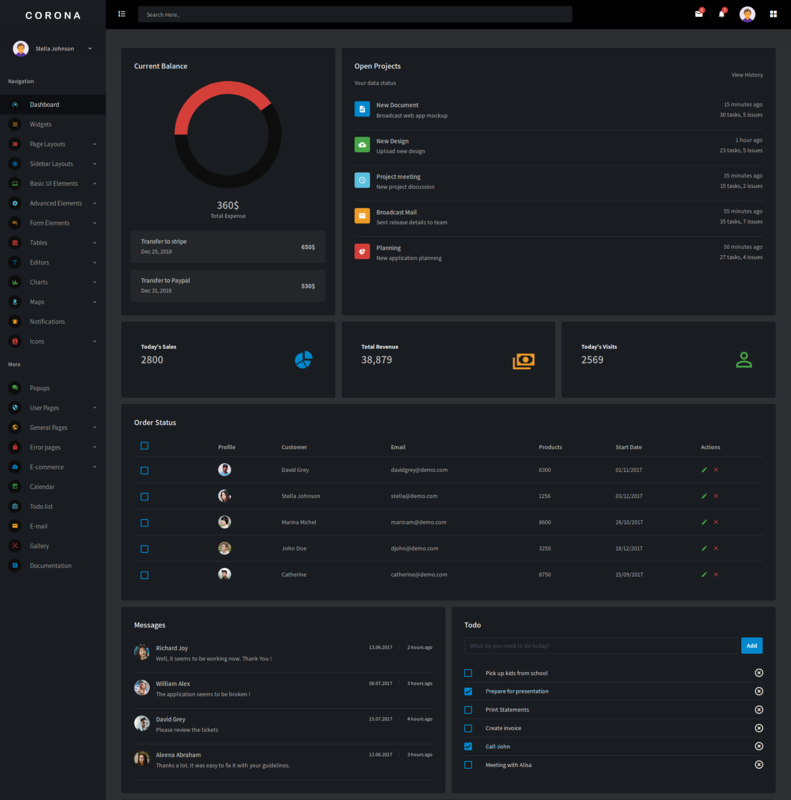 Most of the Bootstrap admin templates available in the market boasts an excellent collection of pre-built demos and templates for your app’s admin areas and dashboards. The good news is that all these templates can be customized as per the requirements of the user. Multiple numbers of UI kits and several other important features are available with these templates. 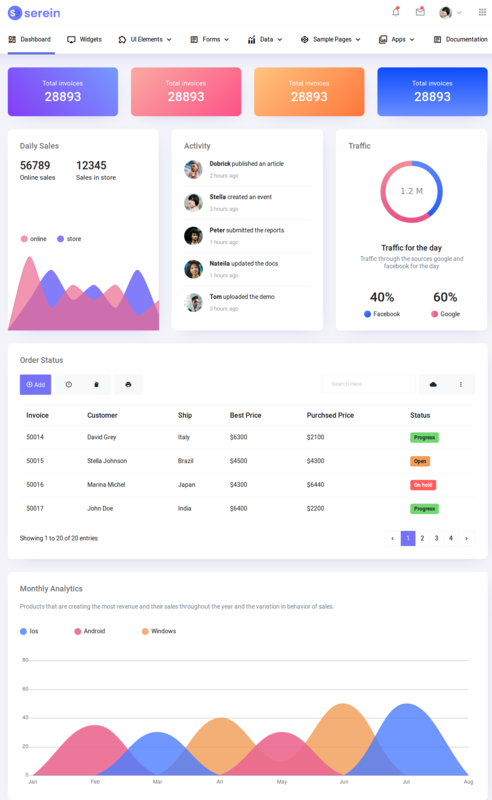 Some of the best Bootstrap admin templates of 2019 that you should definitely try are the following. Finding a suitable Bootstrap admin template that will help you to bring the desired results to your website may seem like a challenging task to many. If you are stuck in such a confusing scenario, then you should consider checking out the Equinox bootstrap admin template. The excellent features and handy elements that are available with this template will help you to easily build stunning websites. An interesting aspect of Equinox Bootstrap admin template is that it comes with both light and dark themed versions. In addition to that, vertical and horizontal layouts are available with this template. More than 10 well-designed pre-build widgets and multiple numbers of UI elements are included within the Equinox Bootstrap admin template. 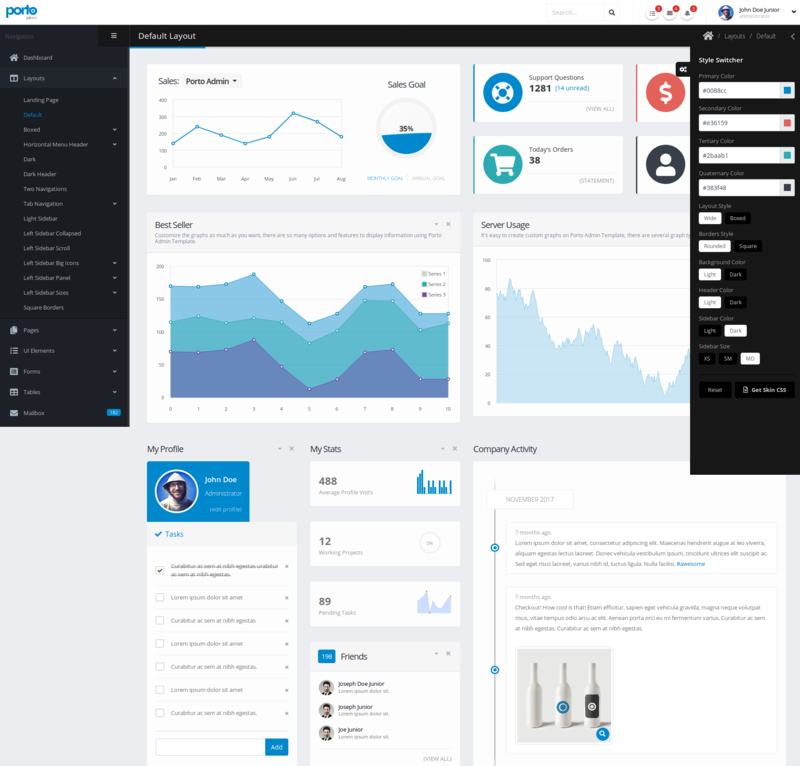 Star Admin Pro is a multi-purpose template that is packed with several exciting features and handy tools, which will help you to build good looking websites. The incredible flexibility offered by the Star Admin Pro template will help you to bring the necessary changes to your website without any hassles. Two different types of page layouts and dashboards are also available with the Star Admin Pro template. In addition to that, multiple numbers of widgets, apps, and layouts are also included in the Star Admin Pro template. The excellent collection of basic and advanced UI elements that comes with this template will make website customization a lot easier. Finally, you should also note that several different types of pages are also available with this excellent template. The HiliteUI Admin Template that comes with a well commended and clean code is an ideal choice for beginners who are working on complex web design projects. Since, the code of this excellent template is clean and simple, developers will easily able to learn and use it. In addition, HiliteUI contains an excellent documentation. Designers will be surprised to hear that HiliteUI contains both light and dark themed versions. Moreover, vertical and horizontal layouts of this template is also available in the market. The high responsiveness, cross-browser compatibility, and easy to customizability of HiliteUI are also worth mentioning. Website designers and developers who are planning to buy the DatavizUI Bootstrap admin template should note that this template has a clean and well-commended code. Due to this, developers even the ones who are new to the world of website designing will be able to easily comprehend it without any hassles. Another interesting thing you need to note about this template is that it comes with light and dark versions. In addition to that, you will also be able to find a horizontal and vertical layout of DatavizUI Bootstrap admin template. 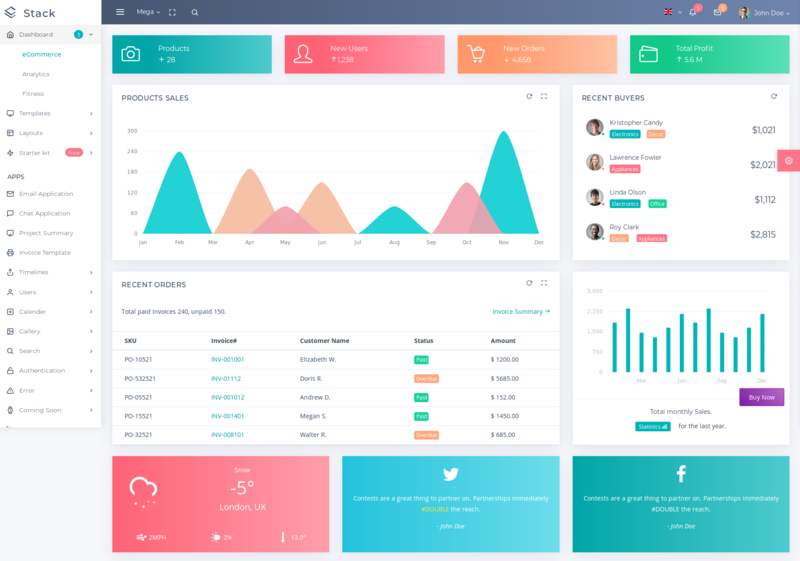 If you are looking for a stunning Bootstrap admin template that will give you access to multiple number of UI elements and other handy tools, then it is best to choose the Corona Bootstrap admin template. Since the styling of this template is done by SASS preprocessor, users will be easily able to take careof customization. If you are opting for the Corona Bootstrap admin template, then you will be able to choose either a dark version or a light version. In addition to that, you will even be able to make use of plenty of different types of pages. 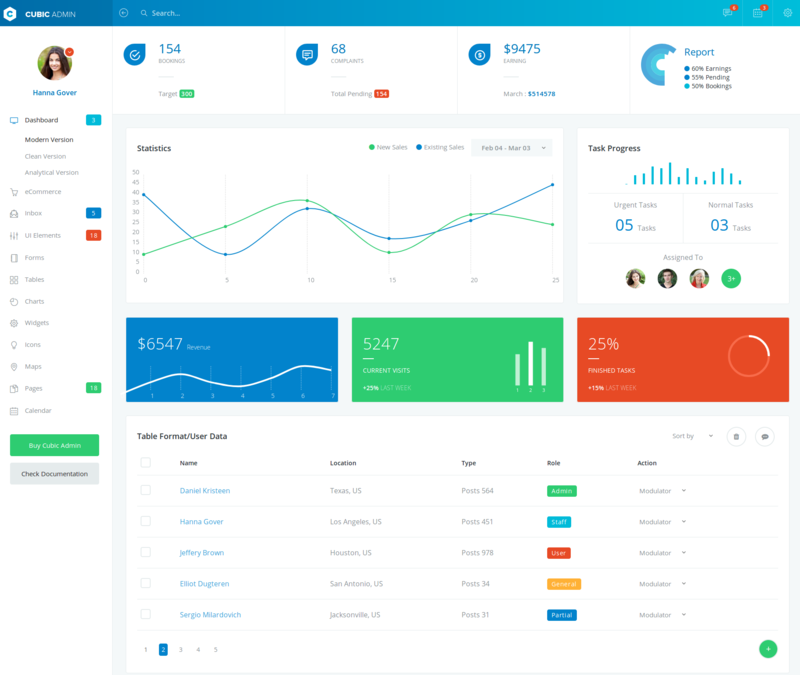 The Fily Bootstrap admin template is built with the latest version of the Bootstrap framework, SASS, CSS, HTML5, and jQuery. The highly responsiveness of this excellent template will enable you to ensure that your website will look good when viewed from different types of devices. The clean and well-commented code of this template is also worth mentioning. Developers who choose the Fily Bootstrap admin template will be able to make use of more than 10 widgets and over 15 UI components. These features and tools will enable you to add a unique touch to your website, which will instantly capture the attention of website visitors. 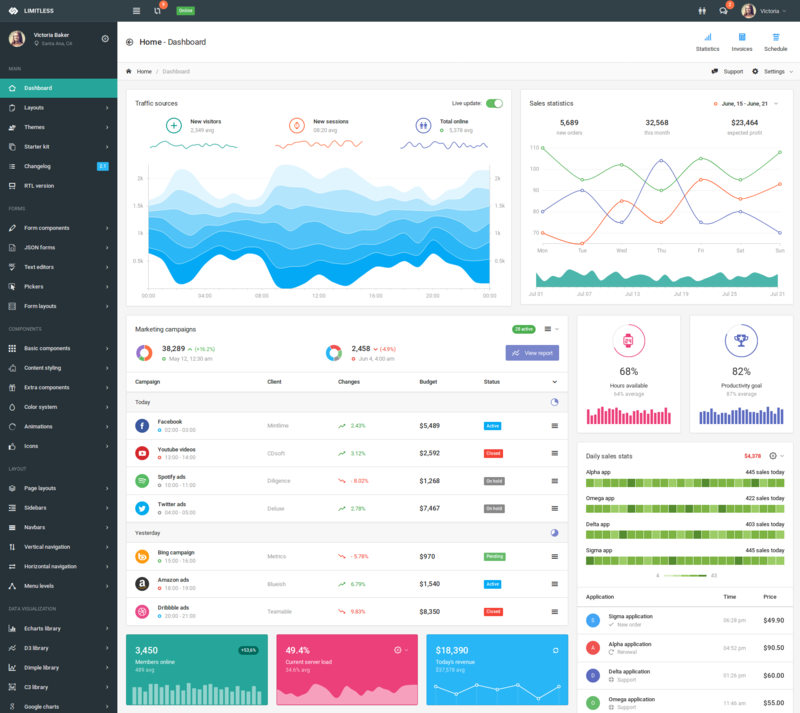 The Serein Bootstrap admin template is equipped with an abundant number of UI elements, tools, and other features that will make website customization and building a lot simpler. The user-friendliness and easy to customizability of the Serein Bootstrap admin template will enable you to easily build flawless websites with utmost ease. The highly-responsive, user-friendly, and feature-rich Bootstrap admin template comes with a fascinating collection of useful elements and excellent components. You can use these components and elements to build a highly-functional website at a rapid pace. The breathtaking design of this template has the unique ability to instantly capture the attention of internet users. One of the best things about the JustDo Bootstrap admin template is that it comes with horizontal and vertical layouts. In addition to that, dark and light version of this template is also available to users. More than 10 pre-built widgets and multiple numbers of charts, form elements, basic elements, and advanced UI elements are also included in this theme. Material Pro is a recently launched Bootstrap admin template that has already gained widespread popularity among web designers and developers. The best thing about the Material Pro template is that it contains five major dashboard variations. The numerous pre-built dashboard designs and multiple numbers of customization options will enable you to easily add a personal touch to your project. This easy to customize and fully responsive template comes with dark and light color schemes. More than 3000 font icons, over 500 UI components, and 700+ pages are available with the Material Pro Bootstrap admin template. In addition to that, six unique pre-defined color skins and plenty of widgets are included in this admin template. Codebase is a highly-flexible framework that was designed for the sole purpose of helping users to create custom dashboards based on the requirements of their projects. If you are looking to create professional web pages and excellent control panels for your new project, then you will instantly fall in love with Codebase Bootstrap admin template. The modular design of the template will enable you to easily pick and use elements that suit your requirements. This highly flexible template is built with Sass, ES6, and Bootstrap 4. Users who are using this template will be able to build different types of web pages with ease. Three different versions of this template are available to users along with multiple numbers of useful features and tools. Finally, the presence of the Laravel Starter Kit is also worth mentioning because it makes building Laravel based projects a lot simpler. Another widely used Bootstrap admin template that is used to build modern dashboards for web designing and development projects is Pages. 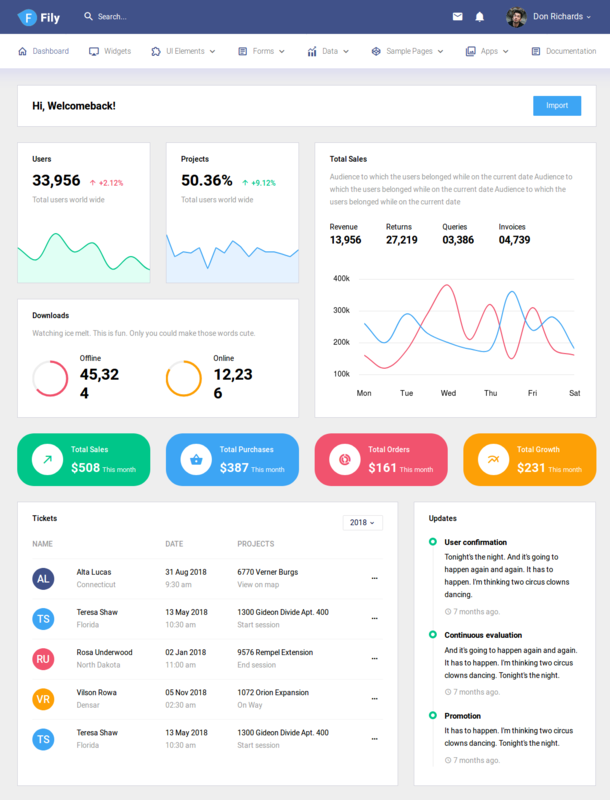 This excellent Bootstrap template enables users to create a stunning dashboard user interface for their app or website at a rapid pace. Users who choose the Pages template will be able to make use of multiple numbers of color skins, module layouts, and menu types. 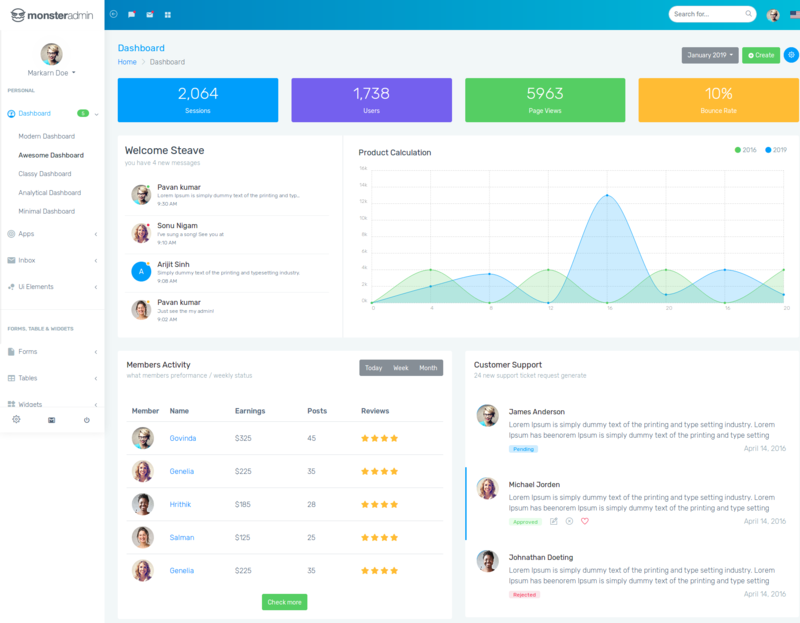 This Bootstrap admin template comes with an intuitive and clean design. The developer-friendly code and browser compatibility of this template has encouraged several developers to settle for this template. More than five dashboard layouts, multiple numbers of pages, and several form components are available with the Pages Bootstrap admin template. 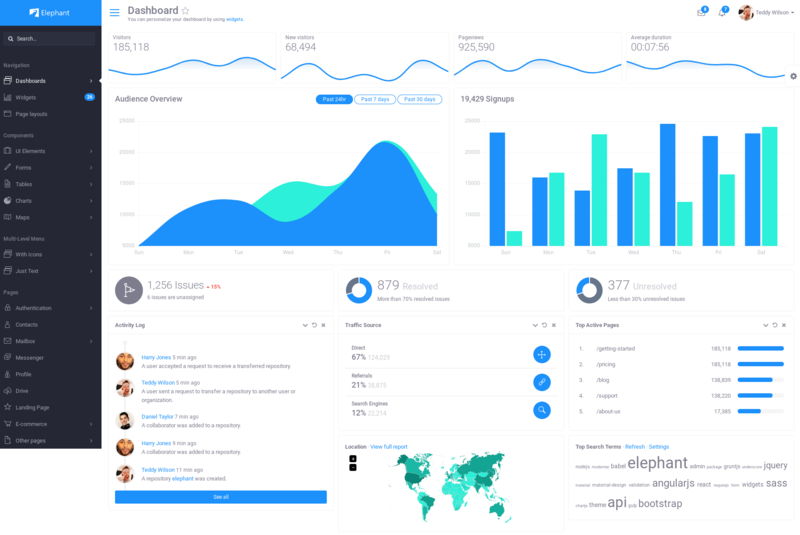 Stack is a modern Bootstrap admin template that comes with seven unique ready-to-use dashboard designs. The pre-built design options that are available with the Stack Bootstrap template will help you to easily customize your website as per your requirements. The best thing about the Stack Bootstrap admin template is that it allows developers to customize each and every aspect of the interface of their app or website. Plenty of menu and Navbar options are available to the ones who use the Stack admin template for their projects. 14 different types of color schemes and seven unique built-in applications are also available with Stack template. 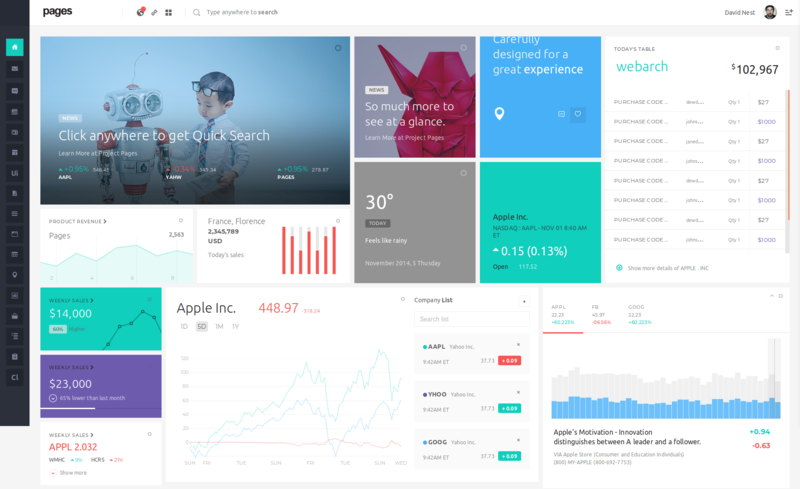 This excellent template also has an excellent selection of more than 1000 UI components. What makes the Monster Admin Bootstrap template unique from other types of Bootstrap templates is that the former contains seven impressive admin demos that come in a wide variety of visual styles. Users will be able to make customizations to their app by using the multiple numbers of excellent UI elements and other tools that come with the Monster Admin Bootstrap template. This clean and well-designed Bootstrap template is equipped with more than 3000 font icons and over 600 unique pages. It is crucial to note that all the pages that are included in the Monster Admin template are fully responsive. Finally, users should also take note of the fact that several types of widgets are also available with this excellent Bootstrap admin template. Limitless is a popular Bootstrap admin template that is regularly updated by its developers to include more tools and features, which will help users to create a custom admin panel that is based on the Bootstrap framework. Developers and designers who have to use multiple numbers of menu for displaying data should consider checking out the Limitless Bootstrap admin template, as its flexible user interface will surely impress you. The Limitless Bootstrap admin template comes with four different types of pre-built layouts and an abundant number of form components. In addition to that, this template offers an excellent selection of elements that can be used to make the necessary customizations to your project without any hassles. 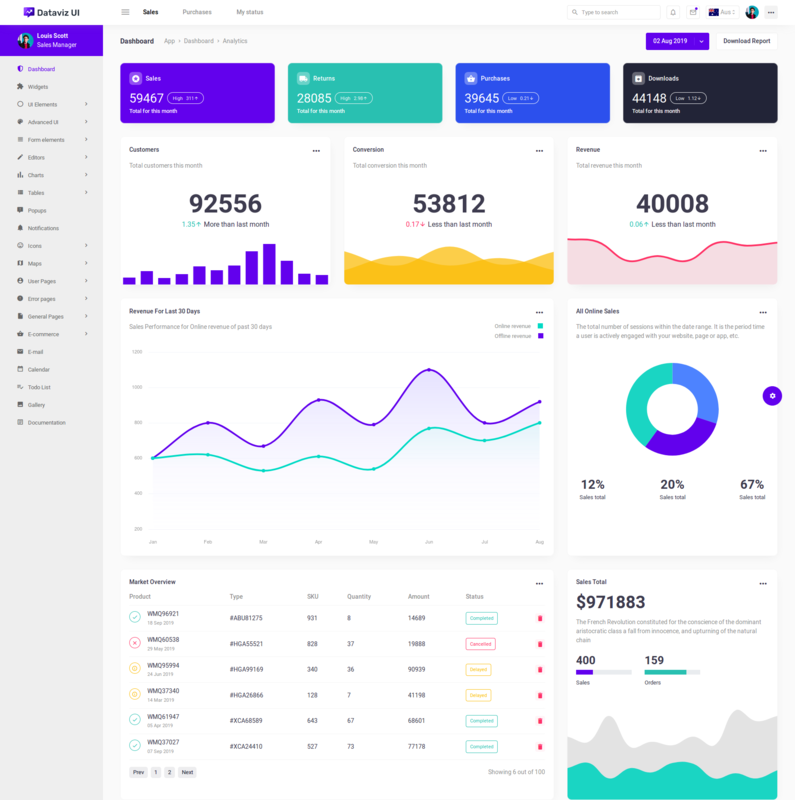 Porto Admin is undoubtedly one of the best Bootstrap admin templates of 2019 and it helps developers to easily build a custom admin panel for their project. The collection of dashboards that are available with the Porto Admin Bootstrap template keeps growing with each new update. In addition to that, the number of widgets and features in the template has increased over the last few years or so. It is significant to note that more than 60 template pages are available with the Porto Admin Bootstrap template. The number of plugins that are included in the Porto Admin template is more than fifty. The interactive charts, handy features, and exclusive plugins of Porto Admin will surely come in handy to users who are working on web design and development projects. Elephant Bootstrap admin template was originally created to help developers add a modern interface to their online service or web application. Users who select this template will be able to make use of six unique variations of the main demo that uses different types of color palettes. This will enable you to easily identify a color scheme that is suitable for your project with ease. One of the most attractive aspects of the Elephant Bootstrap admin template is that 12 themes are available with it. Moreover, this fascinating admin template is even equipped with eight layout options. This well-documented template is also highly responsive and compatible with different types of browsers like Google Chrome, Edge, Firefox, and even Internet Explorer. 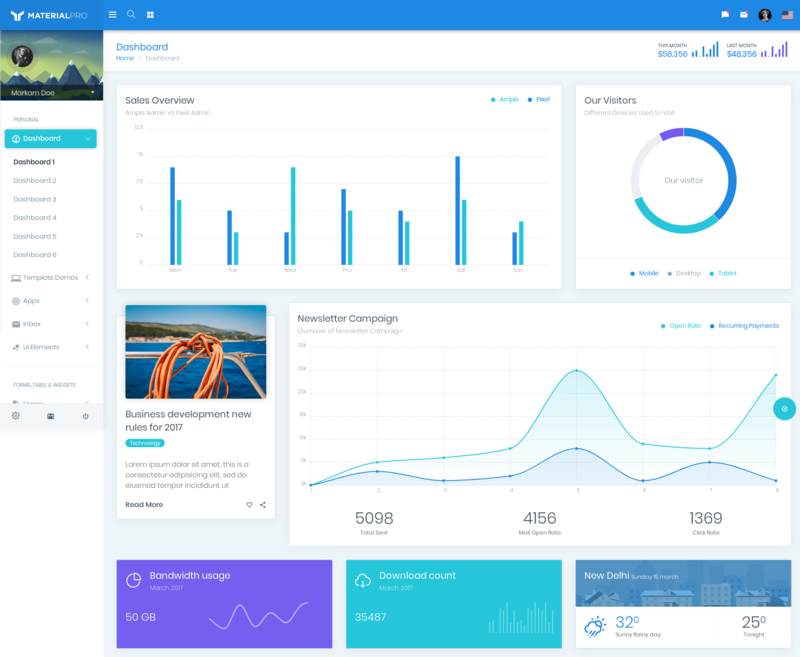 Material Dashboard Pro is an excellent Bootstrap admin template that was inspired by Google’s Material Design style. The different types of sidebar layouts and collapsible menus of this template makes it suitable for projects, which have to display plenty of elements and options without overwhelming site visitors. This template also has a fascinating collection of well-executed animations. Developers who are using the Material Dashboard Pro template will gain access to approximately 200 handcrafted components and about 15 customized plugins. 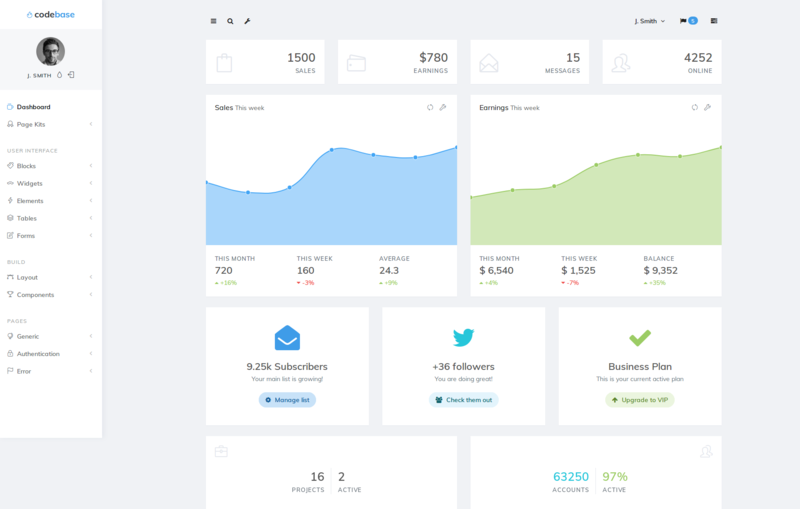 This fully responsive Bootstrap admin template is also equipped with 27 unique example pages. Finally, this template also boasts an abundant collection of useful elements and components. 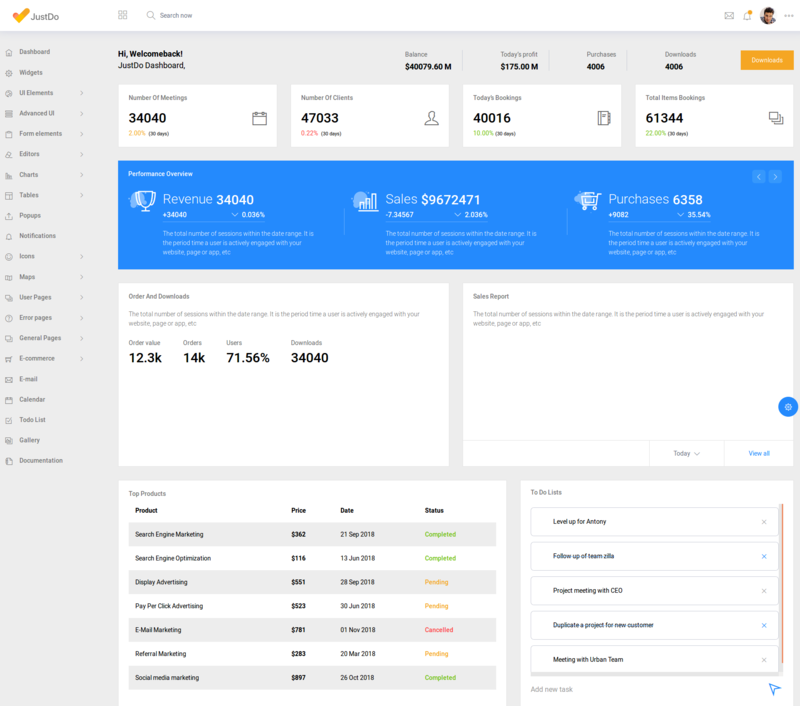 If you are searching for a Bootstrap admin template that is e-commerce friendly, then Cubin Admin template is one of the best options available to you out there. The pre-built e-commerce demo of this template is excellent and ready to use. 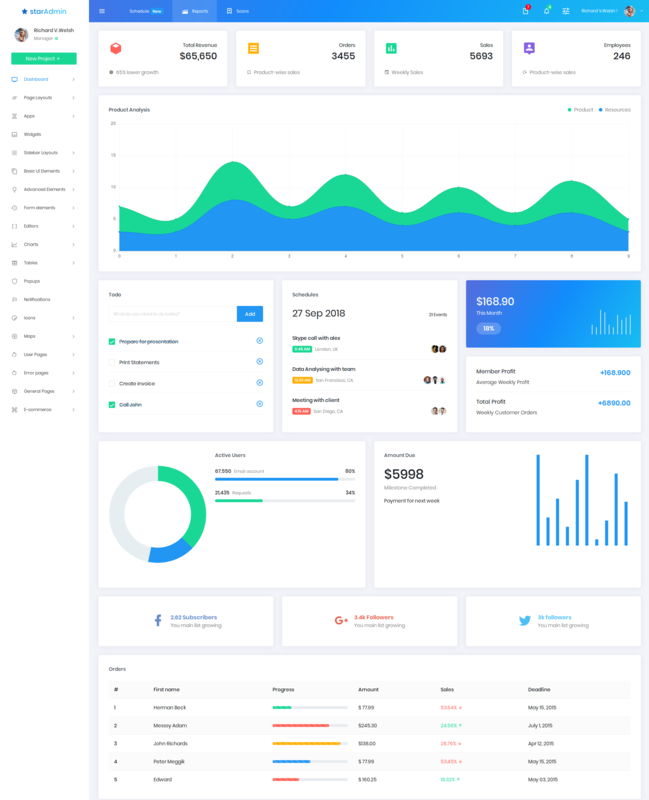 In addition to that, this Bootstrap admin template also has an amazing selection of dashboard panels that are focused on e-commerce. Dashboard panels like orders statuses, product information, and sales statistics can be easily connected to the reporting system. 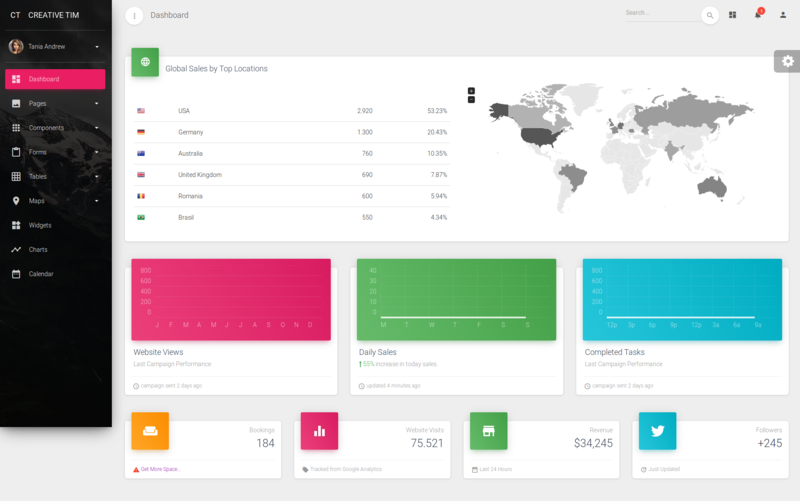 More than four different types of dashboards and six unique color skin options are available with the Cubic Admin template. Users who opt for this template will also gain access to more than 70 pages and over 200 UI components. All the pages in the Cubic Admin Bootstrap template are fully responsive. In addition to that, multiple numbers of table examples and font icons are also present in this template. Developers who are designing a website or developing an app for the first time in their lives might not be able to tell which one of these templates is the right choice for their project. 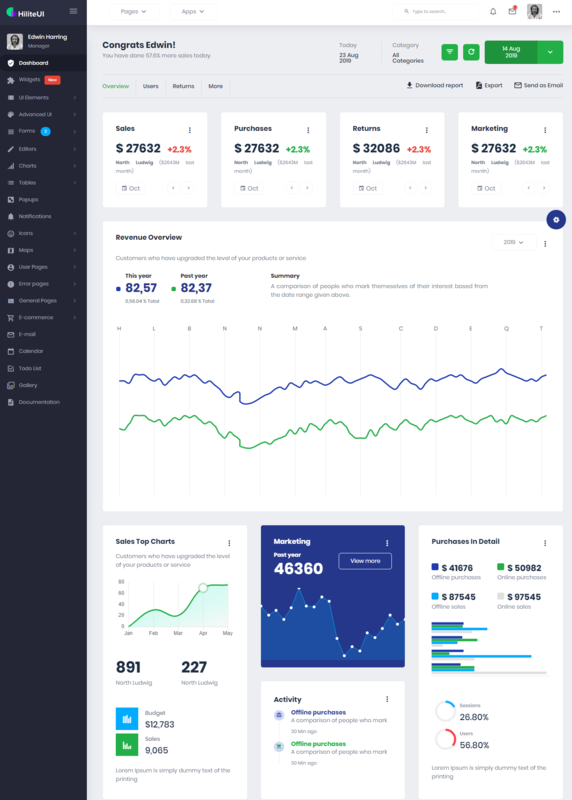 So, if you wish to learn more on how to select the best Bootstrap dashboard templates, then get in touch with us because we are here to help you. This entry was posted in bootstrap and tagged admin, bootstrap, templates.